You won't ever have a hard time remembering these amazing Memorial Day desserts. That's because what's to follow is a slew of patriotic, delicious, and star spangled goodness. Take a look! Red, white, and blue colors are everywhere on Memorial Day. 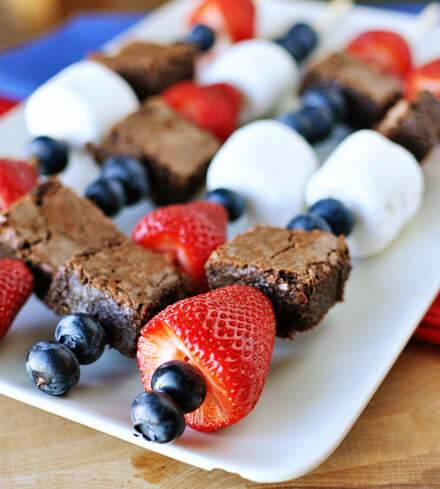 As we celebrate our veterans, give your taste buds something to get excited about too: these brownie and fruit kebabs. Aside from taking the time to make the brownies in your kitchen, you'll only need to skewer blueberries, strawberries (or another red fruit), and marshmallows. You could sub out the brownies too and just stick to the red, white, and blue. These are sure to be crowd-pleasers and something that will add festiveness to your Memorial Day picnic. The American flag is THE emblem of freedom and patriotism. 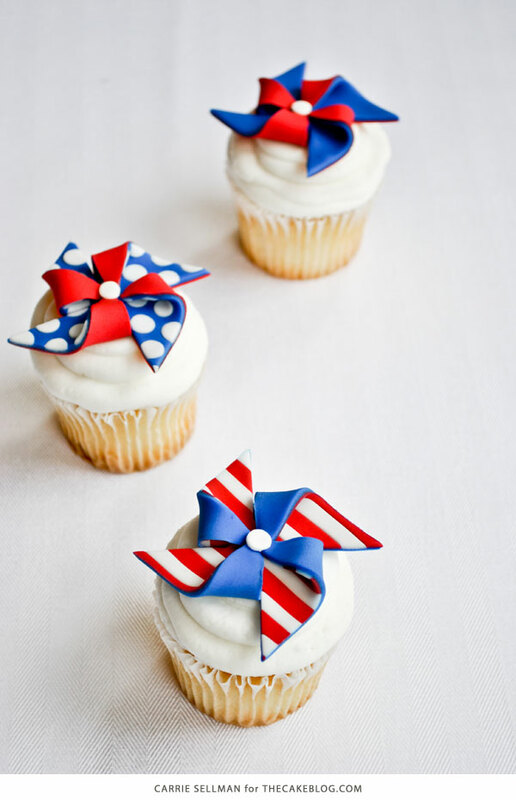 Fly some around your home and represent America on the dessert table too. This cake tutorial is very user-friendly and will walk you through every step of baking this patriotic cake. If you're celebrating a certain veteran or active-duty member of your family, you can even write their name on the cake to show them how thankful you are for their service. Who doesn't love a chocolate covered pretzel? They're salty and sweet and crunchy too-satisfying a lot of cravings all at once. 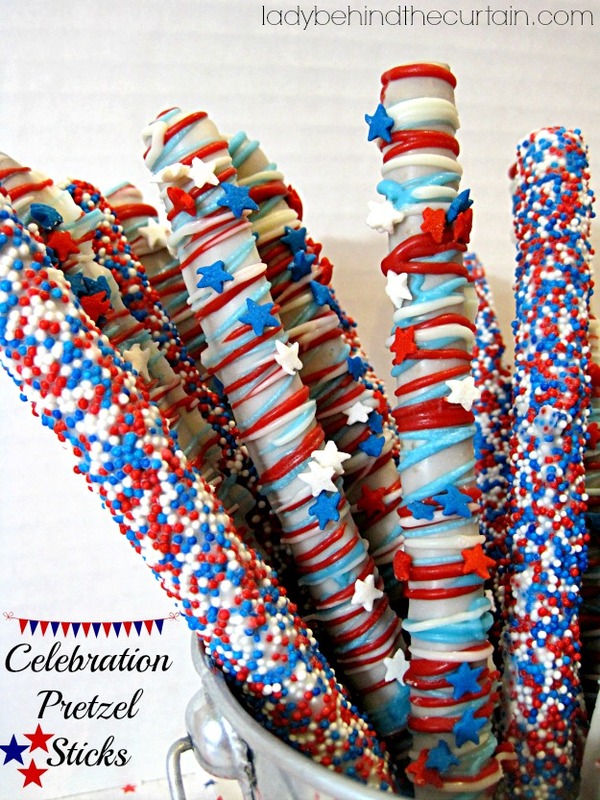 These patriotic Memorial Day candy pretzels are even more spectacular. They're star-spangled with star-shaped sprinkles, and swirled with American colors of red, white, and blue. Once these set up, they're also a very portable confection to bring to a party or give out as favors. Display them in mugs or a jar or lay them out on a platter during dessert for guests to munch on. Pledge your allegiance to this delicious flag. It's yet another creative dessert using a classic recipe: Rice Krispy Treats. This one entails a little bit more than melting butter and marshmallows and pouring it over Rice Krispies. You'll need to separate out colors and designate certain bowls for the red and blue. Pour these warm treats into a flat and rectangular shape and press them down flat, but wait to assemble the flag once they're completely cool. Then, get your knife and star-shaped cookie cutter out and put the pieces of this patriotic puzzle together. 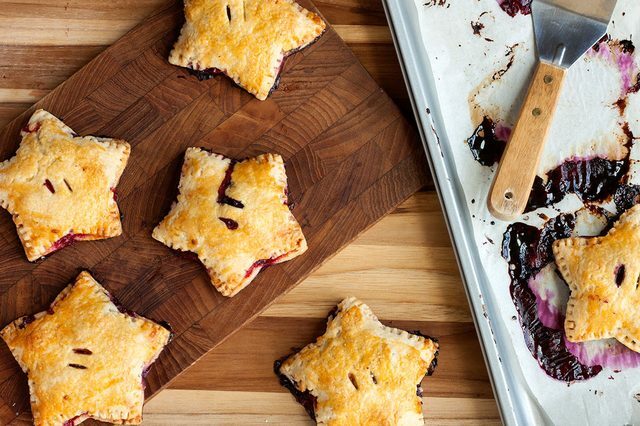 Salute your military friends and family with these star-shaped hand pies. Filled with juicy, sweet blueberry, they're both tasty and pretty to look at. Get your hands dirty in the kitchen rolling out dough, cutting it into star shapes, and stuffing it with blueberry filling. Then, serve Ã la mode with strawberry and vanilla ice cream to represent the red, white, and blue that Memorial Day calls for. These make-ahead pudding pops say "God bless America" and "Thank God for this delicious treat" all at the same time! They're very easy to make and can be done weeks ahead of time and stored in the freezer. Since this is pretty simple and doesn't involve knives or a hot oven, it's a great dessert to have your kids help you out with. Assign each of them a task, like pouring and stirring, then let them do the work while you get busy with other Memorial Day picnic prep. Drooling yet? Most people salivate at the sight of cheesecake. This particular recipe should be no exception. With swirls of cherry and blueberry, it's tart, creamy, and colorful all at the same time. Cheesecakes are the ultimate dessert to make ahead. Do this a couple weeks or months in advance and stick it in the freezer. 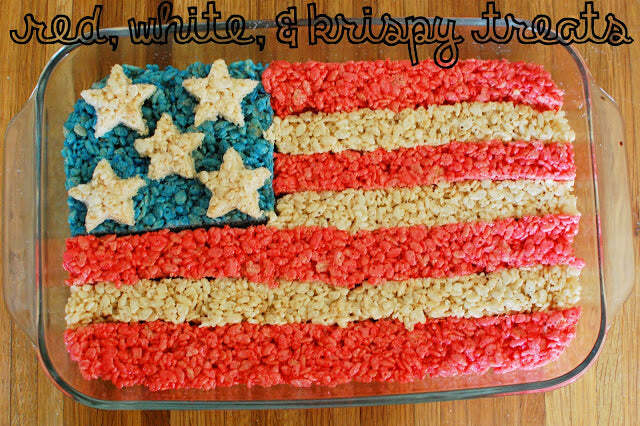 Once it's ready to be eaten, take it out to thaw and place it on a patriotic platter. Depending on what else you're having, cut this into small slivers or giant pieces. Looking for something lighter on Memorial Day? Balance out the menu with this American flag fruit platter. Yogurt or white chocolate colored pretzels, cherries, raspberries, strawberries, and blueberries are the stars of this show. You can customize this menu to your liking by choosing other healthy foods in red, white, and blue hues. This is very easy to set up and you'll just need to take 5-10 minutes to put it all together. Make it even yummier by using a yogurt dip for the fruit or melted white chocolate. Take a moment this Memorial Day to honor those who have served and are serving our country. 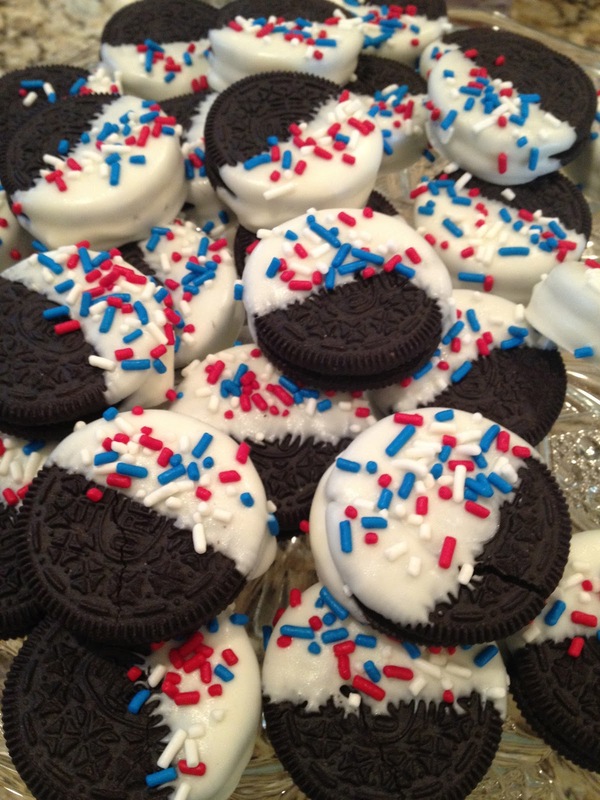 These red, white, and blue covered Oreos are a great place to start. Aside from melting chocolate or using icing, all you'll need to do is buy some cookies, dip them into the icing, and sprinkle them with edible morsels that come in American colors. If you're gearing up for Memorial Day, these also make a great addition to your countertop cookie jar. Jell-O is about as American as you can get. Created back in the 1800s, it's still one of America's favorite treats. 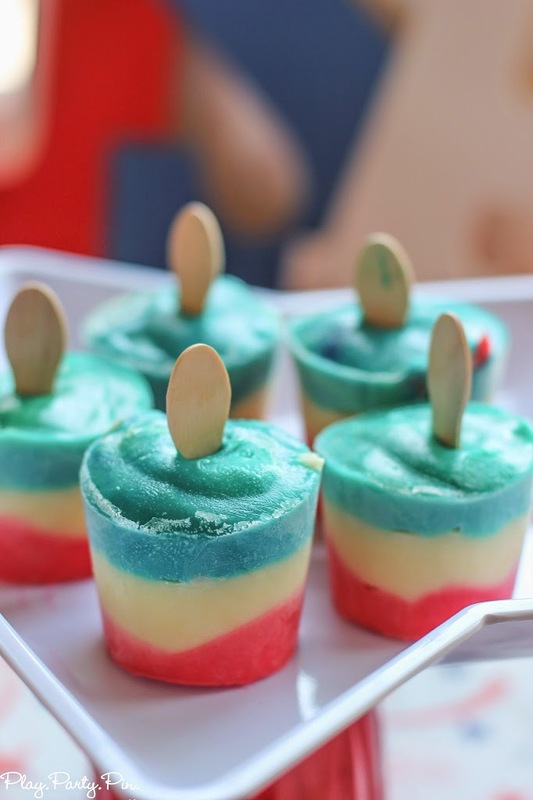 This Memorial Day, make your own red, white, and blue Jell-O dessert cups. If you've never made it before, it's as simple as boiling water, pouring the packet into a bowl, and letting the two mingle on a jelly roll pan until set. Then, you can cut it into cubes and layer it like a parfait. 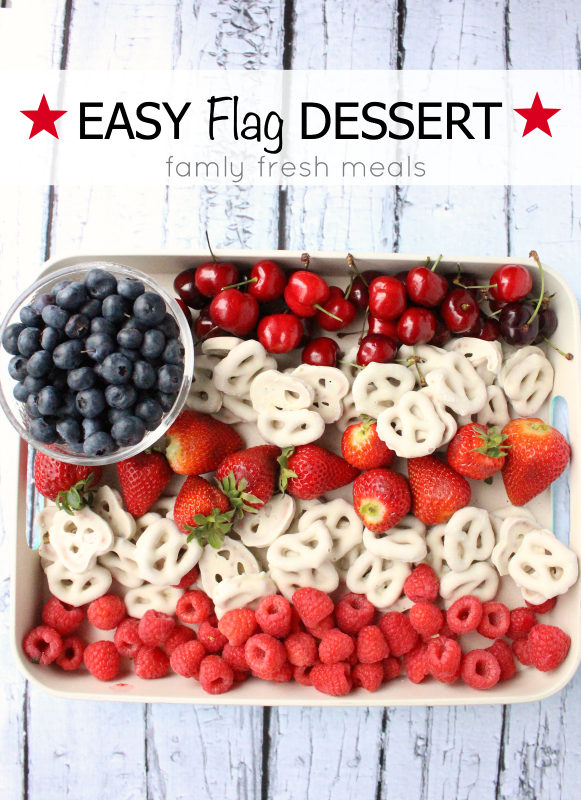 For a different look, use a star-shaped cookie cutter to add even more pizazz to this patriotic treat. Flags, pinwheels, banners, and more are out in full force at this time of year. If the outside of your home is already decorated for Memorial Day, then make sure your desserts are too. Using fondant, you can put a new "spin" on traditional cupcakes. If you've never worked with fondant, it's very malleable and forgiving. If you make a shape you're not crazy about, simply roll it up and reshape it again. These cupcakes really only call for a little decorative flare, so use a cupcake recipe you love and go from there. Military members have done their duty to help keep our country safe. Now do yours and serve your guests something that's both America-themed and delicious. Hosting a Memorial Day picnic later in the day? 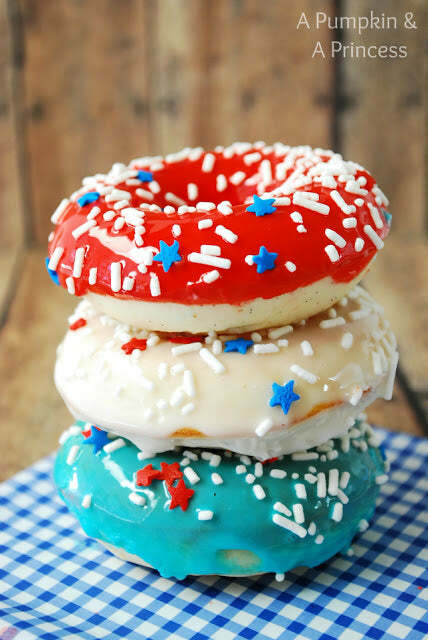 Feed these donuts to your family in the morning to keep them full and put them in the patriotic spirit. If you're planning on heading to a parade or marching in one, these are also a perfect choice to bring to everyone first thing in the morning. Raise the flag on your dessert table with this easy-to-make cake. When you break it down, all it requires you to do is make a sheet cake, frost it with white icing, and then dot the top in red and blue berries. Keep it light and fresh by following suit or use marshmallows, white chocolate chips, red and blue candies, and whatever else sounds good to you. Guests will salute your expertise in the kitchen and you can honor your country by making this commemorative cake. The United States is so special because of the fact that we work together to inspire freedom and achieve dreams. These banana splits remind us of how great we can be when united as one. Individually, a cherry, banana, and whipped cream are delicious. All together, they're even more incredible. 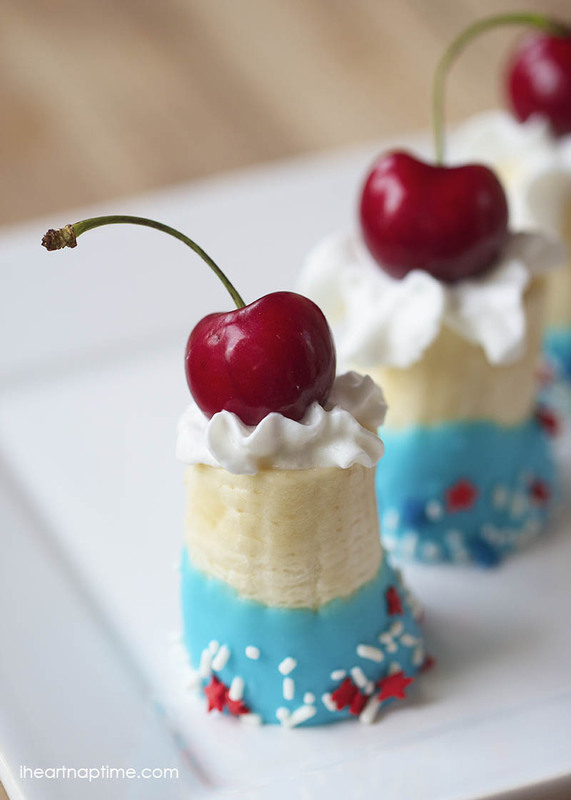 Plus, these cute dessert bites even represent the red, white, and blue that flies proudly on our flag. Top off your Memorial Day by making these banana split bites and reminding your loved ones of why Memorial Day is celebrated in the first place.